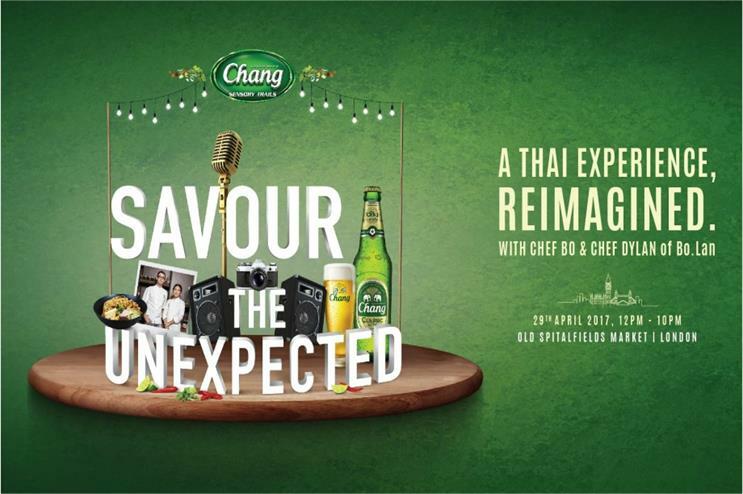 Thai beer brand Chang is creating an immersive experience, Chang Sensory Trails, for the second year running. The 2017 global campaign will kick off in London before travelling to San Francisco, Singapore and New York. The event, which will be staged at Old Spitalfields Market on 29 April, aims to ‘deliver the unexpected’ by introducing the world to a modern, refreshing take on Thai food, art and music. At Chang Sensory Trails, the aim is to provide a story behind every bite. Curated by Chef Bo and Chef Dylan, from renowned restaurant Bo.Lan, the duo is eager to share with visitors a unique culinary journey inspired by their fondest memories. At the experience, guests can indulge in food from some of the UK’s finest Thai restaurants. Last year's campaign was launched in Singapore, Los Angeles and London, although the London leg of the trail, which was expected to be held on 14 October last year, was cancelled following the passing of Thailand's King His Majesty Bhumibol Adulyadej. More: Thai beer brand Singha devised a pop-up last summer with the aim of transporting visitors to a classic Thai street bar, complete with eclectic decor, a golden sun deck and hanging chairs.